Rabbi Eliyahu ben Shlomo Zalmen, the Vilna Gaon (1720-1797) is descended from several prominent rabbinical scholars of Vilna: Rabbi Moshe Rivkas (1596-1671) and Rabbi Moshe Kremer (died 1688). The ancestry of these rabbis was known by the Gaon’s biographers for only a few generations, no earlier than the mid sixteenth century. To date relationships with other prominent rabbinical families was unknown. This was a rare situation considering that most ancient [or other suitable word] rabbinical families were interrelated and could trace their ancestry for centuries. During the pre-Exilic period the Jews preserved records of their genealogical connection to the nation. This continuity was lost to a great extent due to the disruption of the Exile to Babylon and the Diaspora in Europe. Many families painstakingly preserved their traditions of descent even in the post-Exilic period. Some of these families settled in the Rhineland and France in the ninth and tenth centuries. A prominent family which claimed Davidic descent was that of great Biblical and Talmudic commentator Rashi (1040-1105). Traditions of descent from famous rabbis and in particular from Rashi have long intrigued genealogists. The subject was discussed at length in several issues of Avotaynu some years ago. Rashi’s family and disciples established centers of learning and laid the foundations of the communities which became the hub of Jewish life in many towns in Western Europe. Later, in the fourteenth century, their descendants moved to Eastern Europe. Thus a vast interrelated dynasty of rabbinic families spread across Europe. Since most of the prominent rabbinical families are inter-related due to Shidukhim (matchmaking), there was a core of medieval rabbinical families who were descended from Rashi. Some examples are Treves, Shapira, Luria, Katzenellenbogen, Jaffe, Heilprin, Landau, Lipshitz, Margolis, Rapaport, Heller, Weil, Isserles, Shorr, Klausner, Horowitz, Katz, Teomim, Epstein, Gunzburg, to name but a few. These families comprise the root from which most other rabbinical families stemmed. 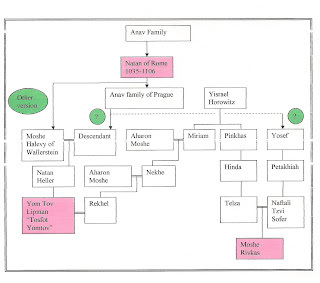 A specific family may descend from a number of marital ties between rabbinical families, which ultimately connect back to Katzenellenbogen, Luria etc, and through them to Rashi and King David. A new study of the ancestry of the Vilna Gaon by this author revealed previously unknown sources which when correlated show that the Vilna Gaon is in fact descended from many of the above families and is descended from King David. 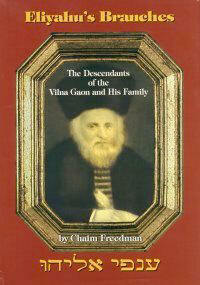 An extensive study of the ancestry of the Gaon of Vilna was written by the late Benyamin Rivlin and published in Sefer Hagra . The Gaon's parents were Rabbi Shlomo-Zalmen (died 1758) and Treina. His mother came from the town of Seltz (today, Selets) near Grodno. His father came from a prominent Vilna family. The known male line of the Gaon's ancestry commences with Rabbi David Ashkenazi (died 1645), who was a Rosh Yeshiva in Lemberg, Poland. According to Professor Louis Ginzberg, David Ashkenazi may have been identical with Rabbi David, son of Mordekhai Ashkenazi, mentioned in Klilat Yofi. David's son, Rabbi Moshe Kremer (died 1688), held the position of Av Beit Din (chief rabbi) of Vilna. Moshe Kremer's son, Rabbi Eliyahu (died 1710), was known as “Khassid” due to his piety. Eliyahu Khassid had three sons: Rabbi Yissakhar Ber (or Yissakhar Dov), Rabbi Tzvi Hersh (died 1765) and Rabbi Moshe (died 1765). Tzvi Hersh was the ancestor of several prominent families, includ­ing Rivlin and Eliash, who held influential posi­tions in the Vilna community. Yissakhar Ber was the father of Rabbi Shlomo Zalmen, who was the father of five sons and a daughter. The eldest son was Rabbi Eliyahu, the Gaon of Vilna (1720–1797). The Gaon's great-grandfather Eliyahu Khassid married into another prominent rabbinic family. His wife was a daughter of Rabbi Petakhiah, son of Rabbi Moshe Rivkas (died 1671). Rabbi Moshe Rivkas came to Vilna from Prague in the early seventeenth century. During the Cossack massacres in 1655, Rivkas fled to Amsterdam, where he completed his commentary on the Shulkhan Arukh called Be-er Hagolah. 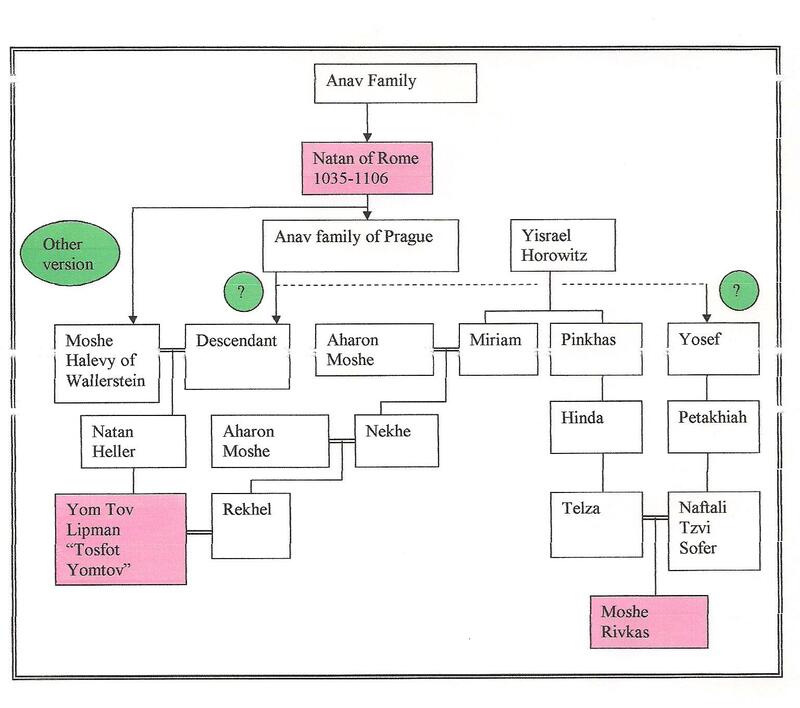 The earliest known ancestor of Moshe Rivkas was Yosef Hakhaver of Ofen (later Budapest), one of the members of the Jewish communi­ty of Vienna who was exiled to Prague in 1559. Yosef's son, Rabbi Petakhiah (died 1598), was sofer (scribe) of the Prague community, as was his son, Rabbi Naftali Tzvi Hersh. Naftali Tzvi Hersh Sofer (died Prague 1601) was the father of Rabbi Moshe Rivkas. Little is known about the Gaon's female ancestors. There are two versions as to the identity of Naf­tali Tzvi Hersh Sofer's wife. Shapira refers to Naftali as Tzvi Hersh Fasi and records his wife's name as Rivka, a daughter of Natan Mandel, son of Meir of Krakow. …….Samalion (which is the name of an angel as explained by our ancestors the Arukh and the Baalei Hatosafot)……..Two lines of ancestry are noted, one from the author of the Arukh, Rabbi Natan of Rome (1035-1106). A gap of 700 years between the Gaon and Natan makes it difficult to establish the nature of the descent. A family which also claims descent from Natan is that of Rabbi Yomtov Lipman Heller (1574-1654), author of Tosfot Yomtov. Research of the Heller family might establish a connection with the Vilna Gaon’s ancestors. It might be claimed that the term “zikneynu”, “our grandfathers/ancestors” could mean “our elders” and not necessarily ancestors. But that identical term “zikneynu” is used by he Gaon’s sons in their introduction to his commentary on Shulkhan Arukh Orakh Khaim . There the term “zikneynu” is applied to Rabbi Moshe Rivkas, the Gaon’s great-great-great-grandfather. In those instances where scholars of previous generations are referred to, the term usually used is “khazal” meaning “our wise men of blessed memory”, or “razal” meaning “our rabbis of blessed memory”. In Saarat Eliyahu10 Avraham uses the term “razal” for other scholars and only in this one instance uses “zikneynu” to refer to his ancestors Natan of Rome and the Baalei Hatosafot. ……… How have we forgotten our holy ancestors. The rabbi the Gaon of our strength our Rabbi Moshe of blessed memory, Av Beit Din of community may it thrive, who saved us from several slanders and blood libels through his wonderful deeds. And from evil officials, as told us our lord our teacher and Rabbi my father the Gaon … who knew in his youth elders who told him, and the son of the above Gaon Reb M. of blessed memory, the rabbi the Khassid Rabbi Eliyahu of blessed memory after whose name our lord our father our teacher the rabbi of blessed memory was called. His great piety and separation, and the thunder of his brave righteousness …. A possible relationship between Moshe Rivkas and the Katzenellenbogen family was mentioned in Eliyahu’s Branches, the Descendants of the Vilna Gaon and His Family. At the time of writing of that book, evidence to explain the claim was not available and so the author wrote “This claim is unsubstantiated”. New evidence makes that statement no longer appropriate. His wife was Mrs. Telza – of the root of the Gaon Reb Shaul Wahl, and apparently he was “His Honor Hirsh the son of the master the honorable Petakhiah Sofer, tender in years, Sofer son of Sofer, who passed away in Elul 5361  in Prague.Although Benyamin Rivlin does not refer to his father’s comment about Davidic descent, if, as he states, Moshe Rivkas mother was “of the trunk of Shaul Wahl” then Moshe Rivkas was thereby descended from King David since Shaul Wahl’s family, Katzenellenbogen was descended through the Luria and Mintz families from Rashi, and thereby from King David. This reference to Telza, Moshe Rivkas’ mother, appeared prior to Benyamin Rivlin’s comment in 1971, in 1900 in Bentzion Eizenstadt’s Dor Rabanav Vesofraf where he quotes Tzvi Hersh Edelman as stating that Telza was “a granddaughter of Shaul Wahl”. Edelman wrote in 1845 Gedulat Shaul a history of Shaul Wahl’s family based on a 1755 manuscript Yesh Mankhilin held in the Bodlean library in Oxford. Yesh Mankhilin includes many details of the Katzenellenbogen family, yet does not refer to Telza. Nor does Edelman’s Gedulat Shaul refer to Telza. That book was planned to appear in four volumes, only one of which is extant. Possibly Eizenstadt took his source from an unpublished manuscript by Edelman. Benyamin Rivlin makes a similar statement without quoting his source, describing Telza as “of the trunk of Shaul Wahl” whereas Eizenstadt narrows down the relationship to “a granddaughter of Shaul Wahl”. a. The author of the book Or Yekarot and Leviat Khen (Zolkva, 5516  ) is descended from Reb Moshe Rivkas and writes that he is from the family Khefetz from the Holy Community of Vilna, and so writes the author of Maamar Efsharut Hativit (Amsterdam 5522  `from the family Khefetz’. d. The Rabbi the Gaon our teacher the Rabbi Reb Gershon Ashkenazi Av Beit Din of Nikolsberg and Vienna, who was among the approbants to the book of Reb Moshe, writes of him that he was his Mekhutan. ……. and my relative the Rabbi author of Shnei Lukhot Habrit……Mordekhai Krasnik of Zeil was a Dayan (rabbinical judge) in Krakow in 1643 and then rabbi in Luntshitz. His relationship with Rivkas requires further research. The period between the birth date of Shaul Wahl and Moshe Rivkas was fifty-one years which had to include two generations for Telza to have been a granddaughter of Shaul Wahl. 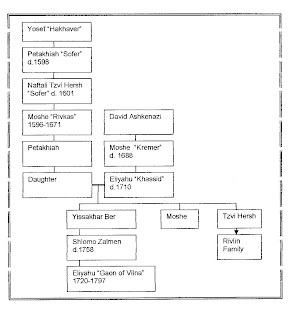 From a study of the various children and grandchildren of Shaul Wahl, it seems that Moshe Rivkas’ mother Telza was a daughter of Shaul Wahl’s son Meir Katzenellenbogen and was born about 1580 when her father was aged about fifteen. Telza was about sixteen years of age when she gave birth to Moshe Rivkas in 1596. The Horowitz relationship stated by Moshe Rivkas confirms the above explanation of the Katzenellenbogen relationship since Meir Katzenellenbogen’s wife Hinda was a daughter of Pinkhas Horowitz, a second-cousin to Rabbi Yeshaya Horowitz, thus explaining why Moshe Rivkas refers to Horowitz as shear besari, “my flesh relative”. Rabbi Pinkhas Horowitz of Prague was a son of Yisrael Horowitz, son of Aharon Meshulam Zalmen Horowitz, son of Yeshaya Halevy Horowitz of Prague. The latter Yeshaya had another son Shabtai Sheftel, father of Avraham, father of Yeshaya (1570-1626), author of Shnei Lukhot Habrit, and known by the abbreviation of that book as the Sheloh. The Sheloh possibly born in Prague, served as rabbi in several communities before taking up the position as rabbi of Prague in 1614. He left that position in 1621 to settle in Eretz Yisrael where he died in Tiberias in 1626. And my father’s father’s father the Rabbi Our Teacher the Rabbi Reb Meir Shaul’s of blessed memory [Av Beit Din of the Holy Community of Brisk], his wife the Rabbanit Mrs. Hinda may her soul be in Eden, daughter of the famous, Our Teacher the Rabbi Pinkhas Segal Horowitz from Krakow, brother-in-law of the Remo of blessed memory. And his father was the famous [Shaul] Wahl] [the Sar] and his wife Mrs. Devorah, may her soul be in Eden, daughter of Reb David. 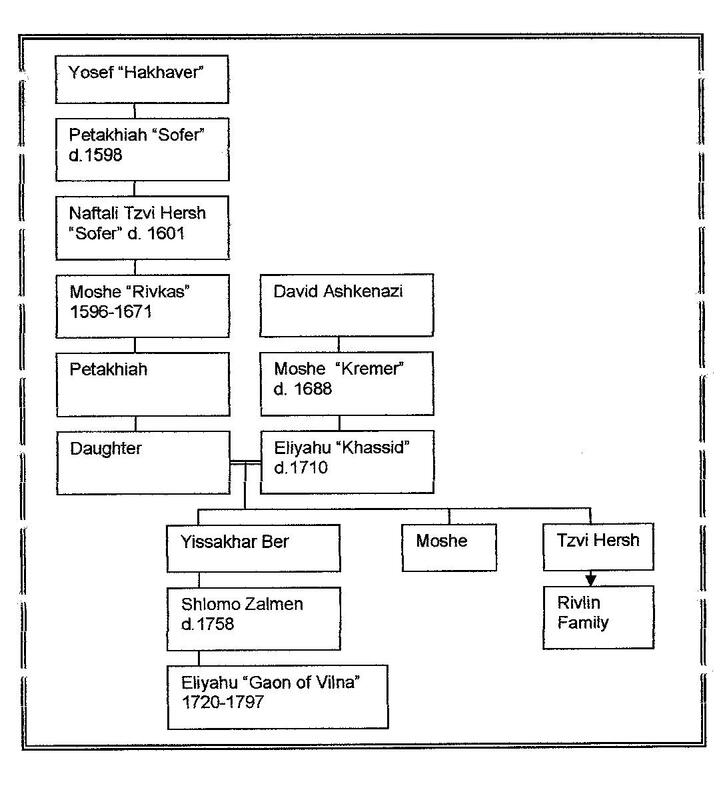 Other relatives of Moshe Rivkas bore the surname (or appellation) Wahl or Wahls. Whether this indicated a relationship with Shaul Wahl requires further research. An additional source for the ancestry of Moshe Rivkas through the Katzenellenbogen and Horowitz families appears in Shnot Eliyahu the Vilna Gaon’s commentary on the Order Zeraim of the Mishnah, edited by his son-in-law Rabbi Moshe of Pinsk. A reference to Moshe’s ancestor Rabbi Shmuel of Antipol, Karlin and Pinsk, as being a blood relative of the Gaon appears there. The comment of Avraham, (son of the Vilna Gaon) in Saarat Eliyahu, about descent from the author of the Arukh, Rabbi Natan of Rome, requires further research. But it should be noted that one family which also claimed descent from Natan was that of Rabbi Yom Tov Lipman Heller (1579-1654), author of Tosefot Yom Tov. Heller’s wife Rekhel was a granddaughter of Pinkhas Horowitz’s sister and thus related to Moshe Rivkas. Heller also functioned as rabbi in Prague during a period when Rivkas could have been acquainted with him. Natan of Rome was a member of the Anav family. Members of the Anav family also lived in Prague. One of Moshe Rivkas’ female ancestors may have been an Anav, thus accounting for Avraham’s comment about his descent from Natan of Rome. Most sources claim that Natan Heller was descended from Natan of Rome through his father. One source states that it was though his mother. Freedman, Chaim. Eliyahu’s Branches, the Descendants of the Vilna Gaon and His Family. Avotaynu, Teaneck, New Jersey U.S.A. 1997. Avotaynu, Spring 1989, Spring 1990, Winter 1994, articles by Neil Rosenstein and Paul Jacobi. Fishman-Maimon, Yehuda Leib. Sefer Hagra. Jerusalem, 1954. Ginzberg, Louis. Students Scholars and Saints. New York, 1958. Dembitzer. Klilat Yofi. Krakow, 1888. Klausner, Yisrael. Toldot Hakehilah Haivrit Bevilna. Vilna, 1935. Rivkas, Moshe. Beer Hagolah . Amsterdam 1661-1664. Rivlin, Eliezer. Sefer Hayakhas Lemishpakhat Rivlin Vehagaon Mivilna. Jerusalem 1935. Shapira, Yaakov Leib. Mishpakhot Atikot Beyisrael. Tel Aviv 1981. Kahana, S.Z. Anaf Etz Avot. Krakow 1903. Avraham son of Eliyahu (the Gaon). Saarat Eliyahu. Grodno 1876. Heller’s wife was a great grand-daughter of Yisrael Horowitz, who it will be seen later, was an ancestor of Moshe Rivkas. Eliyahu the Gaon of Vilna. Commentary on Shulkhan Arukh Orakh Khaim. Shklov 1803. Introduction by the Gaon’s sons Yehudah Leib and Avraham. Freedman, Chaim. Eliyahu’s Branches, the Descendants of the Vilna Gaon and His Family. Avotaynu, Teaneck, New Jersey 1997. Rivlin, Benyamin. Reb Moshe Rivkas. Jerusalem 1971. Eizenstadt, Bentzion. Dor rabanav Vesofrav. Vilna 1900. Edelman, Tzvi Hersh. Gedulat Shaul . London 1845. Katzenellenbogen, Pinkhas. Yesh Mankhilin. Boskowitz, Moravia 1755; edited by Feld, Yaakov Dov, Jerusalem 1986. Khefetz family in Prague: Hock, Mishpekhot K”K Prague. Prague 1892. Koppelman, Lieben. Gal Ed. Prague 1856. Khefetz family in Vilna, see Rivlin. The exact relationship requires research. Friedman, Natan Tzvi. Otsar Harabanim. Bnei Brak, Israel 1975. Muneles, Otto. Ketovot Beveit Ha’almin Hayehudi Ha’atik Beprag. Jerusalem 1988. Friedberg. B. Toldot Mishpakhat Horowitz. Frankfurt-am-Main, 1911. Moshe of Pinsk. Shnot Eliyahu. Lemberg 1799, Warsaw 1860. Rozenkranz, A. Sefer Yukhsin. Warsaw 1885. Horowitz-Heller, Yekhiel. Megilat Yukhsin. Tel Aviv 1978.